BTS V (real name Kim Taehyung) was seen crying during the concert. During the “Love Yourself” concert held at the Newark Prudential Center in New Jersey on September 29, the member burst into tears, catching attention from Jeff Benjamin, a former Billboard K-pop reporter. 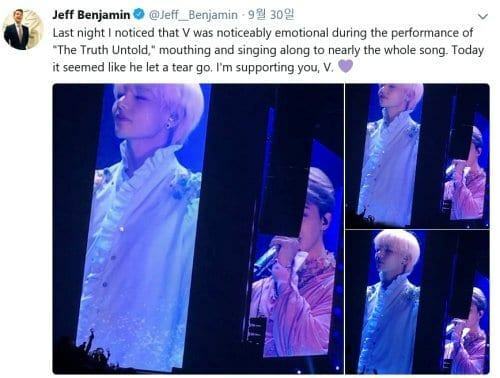 Jeff Benjamin tweeted a tearful photo of BTS V singing “The Truth Untold”. In Singapore, the Philippines, and Malaysia, BTS‘ real name “Taehyung” saw the most explosive responses, ranking first in real time trend. Meanwhile, BTS will be joining New York Citi Field on October 6 and will be the first K-pop singers to perform solo at an American stadium.